<?xml:namespace prefix = o ns = "urn:schemas-microsoft-com:office:office" /> Material Handling Products. Whether you are tooling up for a warehouse, a factory, or an industrial environment, having the proper material handling products on site will make a big difference to how your operation runs. You will find that if staff are able to carry out their duties more efficiently, productivity will inevitably improve as a result, and this will mean a better bottom line. The efficient running of your workplace is made much easier for you by incorporating as many different labor saving devices to the production line as possible. While greater investment at the beginning of a process increases the front loaded costs of the operation, in the long term, the ability to refine processes without the introduction of additional material handling products at any stage will ensure that improvements are made smoothly and without unseen costs at a later date. The key principal that needs to be adhered to in the modern production environment is making sure that staff have what they need when they need it. This lowers the amount of wasted time while waiting for items to be sourced, and means that more time is spent actually working. One key step in getting supplies to workers is the final movement of the material from storage to their workstation, and a number of different material handling products are needed in this one stage. Having a good selection of trolleys and carts on hand means that porters can be used to move inventory on demand. Whether this is in the form of pallet trucks being used to lift goods from one area to another, or simpler hand trucks being used to carry a stack of crates, the right model needs to be used. If your workplace uses particularly heavy materials that cannot be lifted by hand, then either gantry cranes or jibs to lift them into place should be incorporated into the facility, as these will allow for quick transfer of items from cart to workbench, and reduce the risk of staff getting injured when picking up heavy items. One area that is often overlooked in modern factories is the disposal of waste from the factory floor; however thanks to a range of useful tools and equipment available from Easy Rack, you can find a material handling product to cover this aspect of material management. 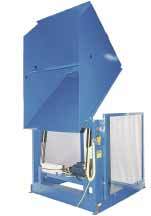 One of our more popular items is the self tipping hopper. 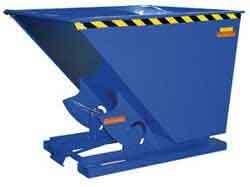 This appears to be just a regular hopper or skip, and can be located in a convenient place where staff is able to dump their waste throughout the day. Once it is full, it can be picked up on a standard fork lift, carried to the appropriate area, and then tipped before being returned to the factory floor to be filled again. This method allows for expensive resources such as a fork lift to be used on numerous jobs at the same time, and simply called upon when required. The process is much simpler than relying on drums for holding waste, and the hoppers can also be used for other purposes within the workplace to maximize the return on your investment. Once you are satisfied with the material handling product you have chose, place your order, and we will deliver it as quickly as possible to give you the best service you could want, and keep waiting time to a minimum. As you continue to read through our selection of Material Handling Products, keep in mind we stand ready to answer any questions you may have about our offerings. Call us at 1-888-776-3720 whenever such questions arise and let us help you make the best investment within your budget. We are located in Houston, Texas.